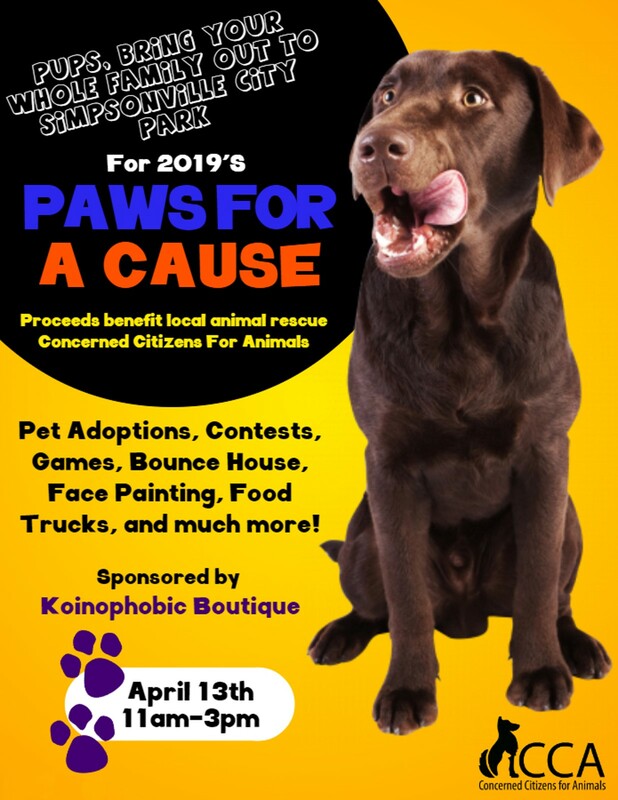 Come out to Simpsonville City Park on April 13th from 11am-3pm as local area businesses come together to raise money for the oldest NO-KILL animal shelter in the Upstate (CCA)! Bring out the kids and the pets for a fun-filled day of pet and family-friendly entertainment. Entertainment includes Animal games, contests, bounce house, face painting, etc. Make sure to enter your pet in one of our contests (Biggest Dog, Smallest Dog, Cutest Pet, Most Talented, etc!) To pre-register for contests or for information on becoming a vendor, sponsor, or participation in any way email request to pawsforacause2019@gmail.com. All contests are FREE to enter with prizes awarded for 1st, 2nd, and 3rd place winners.